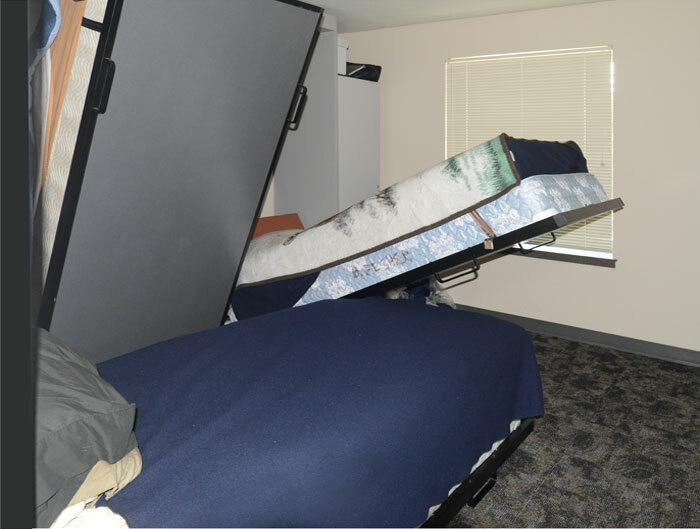 Make a 10 x 10 foot room sleep three Firefighters? Sure, you betcha! 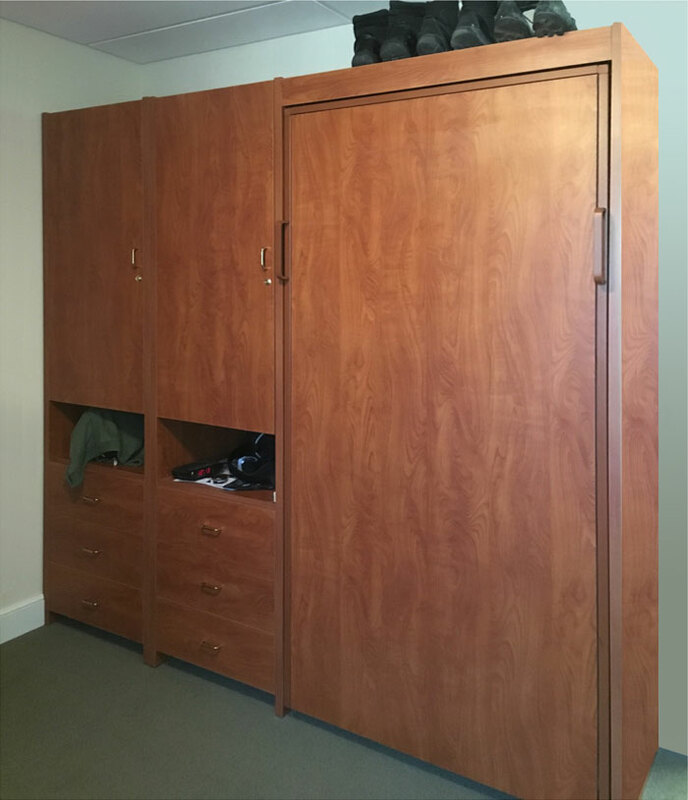 Our Murphy Bed Design Team can prove to you it is possible. Here are pictures of one in Greeley, CO! Each room will hold three Twin XL SICO Room Maker Wall Beds. 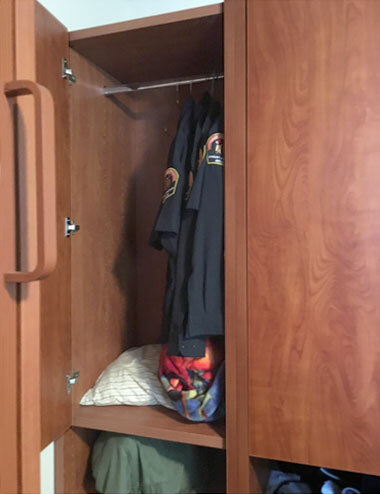 Each member of the Fire Station has their own bed during their tour of duty. A real mattress and foundation. Guaranteed comfort because we don’t limit the Chief’s selection of mattress manufacturer. We manufacture the encasement out of high pressure laminate with 3 mm edgebanding that isn’t just ‘glued on’. We hot air apply this superior capping at 600 degrees! We know those boots and jackets are going to play ‘rough-house’. The Bed Enclosure and Closet Pier Cabinet are overbuilt for rough use. Please ask for our ‘cut-away’ model to be sent you to see the special 170 degree BLUM door hinges. The drawer boxes are Solid Wood with dove tailed corner joints and bottom mounted, soft close, full extend BLUM drawer glides. Superior material, superior manufacture standards. The automatic sloped headboard is covered in padded vinyl to prop pillows up against. That same headboard will fold over when the bed is closed and captures the pillow to be stored away with the bedding left on the mattress. 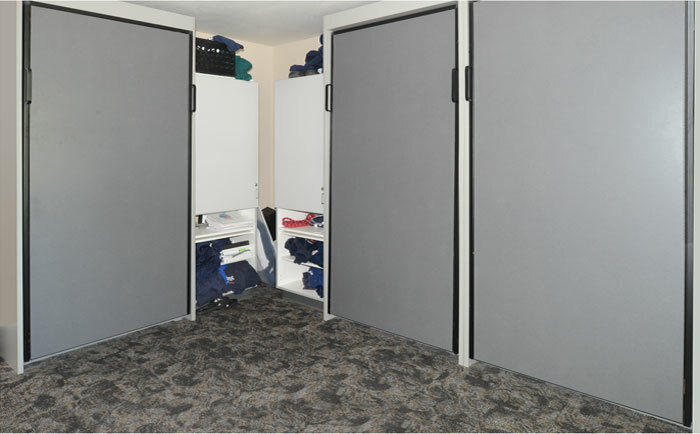 The SICO Room Maker frame and mechanism is the strongest Murphy Bed system available for Fire Stations. Our compression coil lift power pack can’t be compared to the gas piston guys (think hatch back cars). The electrically arc welded metal frame welcomes abuse. We suggest a 30-year life in extreme use. This steel carriage is the strongest in the Murphy Bed Industry. Each of our FlyingBeds has a metal identification tag attached that has the date and serial number of that installation. We are proud of our manufacture. We aren’t a wimpy residential Murphy Bed room manufacturer. Challenge us! Email us today and we’ll be happy to send renderings and quote pricing. Terms are 50% down and balance upon shipment. Shipments are point of manufacture: Denver, Colorado 80216. Depending on workload, production time is normally 6 weeks.